Conspiracy Theory A conspiracy theory materializes when one observes the controlling practices of the Mormon Church, also known as the Church of Latter-Day Saints. This Conspiracy Theory is documented in the book "The Mormon Conspiracy" which shows how the Latter-Day Saints church (LDS) is organized to restrict individual freedoms, individual thought, independence and democracy. 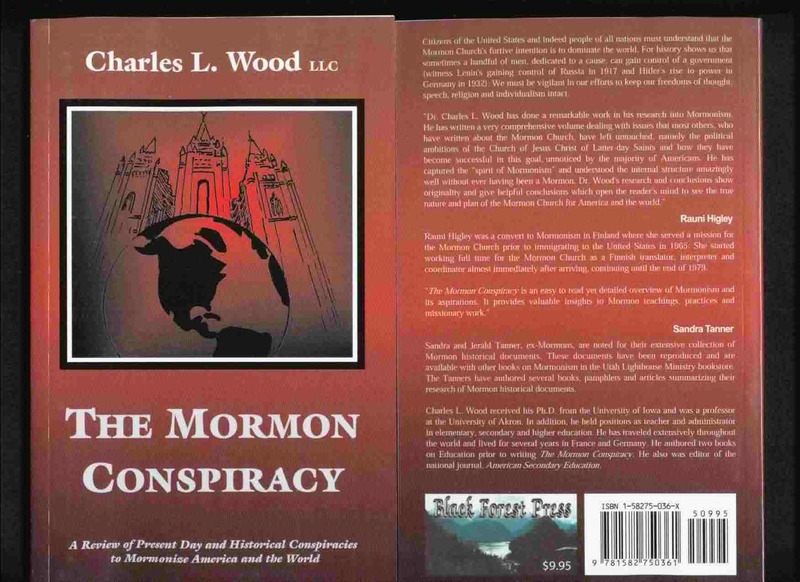 The book "The Mormon Conspiracy" reveals how the Mormon church leaders are involved in this conspiracy and how they conspire to control the United States government and eventually the world by establishing its "Kingdom of God" on earth. The words "Kingdom of God" are in quotes, because in reality this is not a Kingdom of God that the Mormon Church wishes to establish, but rather a Kingdom of the Mormon Church, led by fifteen men, the Presidency (three men) and the Quorum of Twelve apostles of the church. This conspiracy theory gains relevance when concerns are addressed about the Mormon church members . The Mormon church members are controlled by an authoritarian organization much like the Monarchy that prevailed in such European countries as France and England before the French Revolution and before a democracy was established in England. The Mormon church requires religious obedience from members and teaches them that individuals need not think for themselves concerning church doctrine as taught by the Church Authorities, a form of mind control. This is evident even in areas of non-church affairs, such as politics and economics where the church hierarchy expects members to follow its directions. One proof of this is the church’s involvement in defeating the Equal Rights Amendment in 1982 as well as numerous other church-led political activities. The conspiracy can further be recognized when one reads how the LDS has a disproportionate influence in such governmental departments as the FBI, the CIA, and the FCC (Federal Communications Commission). "The Mormon Conspiracy" reveals how the Mormon Church is gaining influence in Congress with the election of greater numbers of Mormon members. Church influence is obvious in the lobbying of congressional members to support Mormon programs and to vote for laws that further their goals. Church hierarchy involvement is apparent in all aspects of government, including the Supreme Court, as shown by the church’s filing of a legal brief with the court, opposing a New Jersey Supreme Court ruling that would prevent the National Boy Scout organization from excluding gays from Boy Scout groups. "The Mormon Conspiracy" also reveals how The Mormon Church leads Mormons to regard the President (or Prophet) of the church to be infallible, and they believe that he has direct communication with God, therefore can do no wrong or make a mistake. Members believe that Church Authorities (fourteen apostles in addition to the president of the church) are also infallible. Therefore, these fifteen Authorities have control of the Mormon Church. There is no democracy in the decision making of the church, since all appointments from the highest to the lowest offices in the church are made under the umbrella of the church president. The scholarly book The Mormon Conspiracy shows that if the Mormon Church were to gain control of the United States there would be no secret ballot election of congressional representatives, no secret ballot election of state legislators, or local governmental officials. All of these officials would be appointed by the President of the Mormon Church, with assistance from other church officials. It is ironic that the Mormon Church that plans to control the United States and world governments is based upon false premises such as the "Book of Mormon."